Displaying 7-9 of 15 results. A partnership that facilitates the reporting of environmental hazards by residents of underserved communities throughout California directly to agencies that enforce the laws should be enhanced and expanded, a University of California, Davis, report says. The report, by the UC Davis Center for Regional Change, will be released at 10 a.m. July 13 in Sacramento as part of a daylong summit on the Identifying Violations Affecting Neighborhoods, or IVAN, program. “The program resembles an environmental version of a neighborhood watch,” said Shrayas Jatkar, a master’s degree candidate in community development who will present the report with Jonathan London, associate professor in human ecology and director of the center. The innovative program studied by UC Davis researchers makes community members partners in identifying environmental hazards through digital technology and crowd sourcing. The partnership among local, state and federal agencies and community groups, started in 2009, has been implemented in the Wilmington area of Los Angeles, the Imperial Valley, Coachella Valley, Kern County, Fresno County and Kings County. It will soon be expanded to Sacramento and San Francisco. The report examined four cases in which IVAN played a significant role: a cattle feed lot polluting a water source, improper disposal of fracking fluid, a hazardous waste disposal site and a gas leak. Ensuring the sustainability of the program through diversified funding. Training community members to enhance their skills as “civic scientists” involved in environmental monitoring. Linking the IVAN and California Environmental Protection Agency reporting systems. Expanding the program to additional communities. 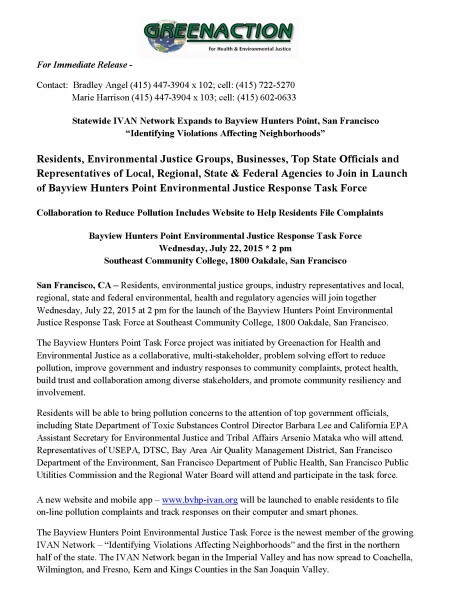 The program represents an innovative approach to transforming the environmental justice-related monitoring ?and enforcement process in California from one based on one-way and often opaque flows of communication to a more collaborative partnership among public agencies, environmental justice organizations and community members, the report said. The summit will include panel discussions with representatives from environmental agencies and focus area organizations including Jared Blumenfeld, the U.S. EPA regional administrator; California Assembly member Eduardo Garcia (D-Coachella); and Luis Olmedo, IVAN founder and administrator and executive director of Comite Civico Del Valle Inc., a nonprofit community education and advocacy group in the Imperial Valley. The summit is co-hosted by the California Environmental Protection Agency and takes place from 10 a.m. to 3:30 p.m. at 1001 I St., Sacramento, in the CalEPA’s Coastal Hearing Room. It will also be streamed by live webcast. This report was funded by the California Wellness Foundation and The California Endowment. The summit is organized by Comité Cîvico Del Valle, Central California Environmental Justice Network, San Joaquin Valley Latino Environmental Advancement Project, CalEPA, and CRC.